As with those possessing other skills through much of European history, musicians have tended to cluster across multi-generational families. Musicologists and musical historians might ignore all but the most celebrated, but these lineages held true for hundreds of years. The last Couperin, organist Céleste Thérèse, died in 1860, just 15 years after what is believed to be the last direct descendent of Bach, Prussian Kapellmeister Wilhelm Friedrich Ernst Bach. And so we arrive at Francesco Manfredini (1684–1762). The son of a church trombonist and the father of the composer Vincenzo and castrato Giuseppe, he was born in Pistoia. Taught composition by Perti and violin by Torelli, his first prominent post, assumed around 1711, was as a violinist in the private orchestra of that music-loving monarch, Prince Antoine I of Monaco. Antoine had studied with Lully, and maintained a regular correspondence with both François Couperin and André Cardinal Destouches. Evidently composer and monarch were well pleased with one another, for Antoine became godfather to one of Manfredini’s sons, and the Prince’s daughter, godmother to one of the musician’s daughters. (Manfredini may have served as music teacher to Antoine’s children, or concertmaster, or both. Details are scarce, and inferences are dangerous.) In 1724 he returned to his home city of Pistoia, and took up the post of maestro di capella at the cathedral. Most of his music from this period was kept solely in manuscript and has vanished, though we know a fair amount about the ongoing contentious relationship he enjoyed with the cathedral chapter, who tried and failed to dismiss him. In any event, he remained at his post until his death. Antoine I was a Francophile, and not just because his nation had become an independent satellite of France. He strove, like many other rulers of the time, to imitate the Sun King’s court in its artistic tastes, and maintained—whether true, or not—that the baton he used on occasion to conduct his orchestra was the final one Lully owned—and applied to his own foot, causing gangrene and subsequently his death. (Batons of the day were lengthy ceremonial staves, their heavy stage thumps in use as late as the 19th century to announce the beginning of theatrical performances.) Presumably Manfredini composed to suit his employer’s stylistic preferences, but that isn’t apparent from his published works. Even his opus 3, dedicated to the Prince, is redolent of Torelli and Vivaldi. The opus 2 collection heard on this disc also exists in multiple copies in Antoine’s music library; however, if it weren’t for its 12th Concerto, per il Santissimo Natale (the so-called Christmas Concerto), Manfredini would likely never be heard at all. Structurally it stands apart from the rest, in three movements rather than four, and is stylistically governed by the homophonic folk elements common to the entire genre. 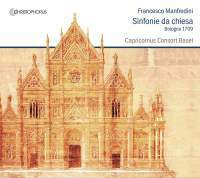 All 12 sinfonie, though, were dedicated in their first printing to the administrators of Bologna’s San Petronio Basilica, where the composer worked for a few years, around 1709. Presumably all of them were played there at various points in the church calendar. They garnered enough attention to warrant a second printing only two years later by Etienne Roger in Amsterdam. The reasons are clear even upon a first hearing. These works are sophisticated examples of the Bolognese school at its best: thematically interesting, rhythmically varied, and harmonically given to moments of strong passing dissonance, with sustained contrapuntal interest throughout. Manfredini also makes excellent use of his two violins for both harmonics and interplay. The Bolognese musicians of the day retained strong musical links with the early development of the sonata, so that the da chiesa format doesn’t inhibit a mix of movement types outside conventional development procedures—among which listeners will recognize slow operatic arias, contrapuntal chases, dances, and virtuosic displays of agility and speed. Manfredini knew, like many musicians of his time, that one of the best ways to encourage sales was to insist that their compositions could be played in several arrangements. Though written in four string parts with the organ largely duplicating the cello (aside from figurations), the viol was listed as optional—so that the whole thing could be played as a trio sonata. The Capricornus Consort of Basel gives us something closer to the original, however, with two violins, viol, cello, violone, organ, and theorbo. They make good use of vibrato as a coloring device, and ornament with discretion during slower movements. Their tone, both individually and together, is attractive, and the musicians integrate well as a cohesive aural group. Tempo choices vary greatly but remain judicious; so when Manfredini labels the finale of the Sinfonia IV andante, he doesn’t mean it in the modern sense, but as a slower kind of fast movement: i.e., moderato, which was not as yet a tempo marking. The engineering is resonant enough to compliment the performers, but dry enough to allow all parts to stand out in relief—as they do in the 11th Sinfonia’s semi-fugal second movement. Technically, the group is easily up to the demands of this music, though aside from the opening pages of the Fifth Sinfonia’s finale, the majority of the music’s challenges are more a matter of tone, phrasing, and balance among partners, rather than furious agility. Top marks for this one. If you enjoy the concertos of Veracini, Torelli, and Giuseppe Valentini, chances are you’ll find much to like on this album.